Center stage in your home office will be a desk. Here we'll cover the basic desk dimensions (desk width, depth and height) that we need for designing your home office layout. There's also information on office chair clearance. And what desk space you need for an office for 2 (or maybe more). I'm not an ergonomics expert. If you need to know how high your monitor should be, then the Safe Computing Tips website can tell you. The typical executive desk starts at 60 x 30 x 30 inches (W x D x H) (152 x 76 x 76cm). There really isn't a standard size. That's a good thing because it means you can use different widths and depths and heights to meet your needs, while fitting in to the space you have available for your home office floor plan. 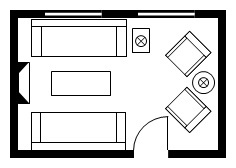 There are some minimum desk dimensions to deep in mind for your home office floor plan. These dimensions are based on how the human body fits at a desk rather than the activities that are going to be carried out at the desk. These are the absolute minimums - it's highly likely you'll be designing or buying something larger unless you just want a spot to quickly check your email. Minimum depth - depends what you want to put on the desk. We've talked a bit over on the home office layout page about desk height. If you're buying a desk or having a desk built in choose the height that's right for you. If you fancy a sitting / standing desk combination and you're not going to spring for one of those fancy adjustable height desks, consider a bar height desk with a bar height chair. Again, it's very much a question of going with what you need to satisfy your requirements. That gives you a 5 foot desk width. You'll be tired of hearing me say it by now, but take a look at what you want to do on your desk and what you want to store on the surface and design accordingly. Measure a workspace that you already use and write down the dimensions - do you want to add or take away any space? We've already seen that the minimum desk depth at foot level is 24 inches so this is your basic minimum desk depth which is plenty. What is the maximum useful desk depth? This depends on what you want from your desk. The maximum work zone depth would be about 30 inches (76cm). Any part of the desk that's wider than this is essentially a display area (great for your name plate and a box of tissues for people sitting opposite your desk) or a storage area (pile those papers high!). A thin but deep desk will allow you to push the laptop or keyboard back and work on some reading or writing for a while. So how much room do you need to leave for your chair from the front of the desk to the nearest obstruction? 23 inches (59cm) is the minimum distance required for a chair behind a desk. This would fit a modest sized chair. 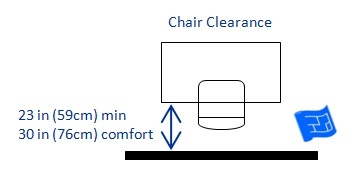 For more comfort and to accommodate a bigger office chair increase the chair clearance to 30 inches (76cm). Swivel chairs make it easier to get in and out from behind your desk, especially if the space is a bit tight. Make sure the arms on your office chair (if any) fit under the top of your desk, other wise you won't be able to sit far enough under the desk to feel comfortable. So if there's two people in the office, how do the minimum dimensions for 1 person work in reality when there's two people in an office. The minimum dimension for one person is 24ft and is based on how much room a person takes up sitting at a chair. In reality we need a bit more room on a desk to spread out. If there are two people next to each other then can share the middle space. 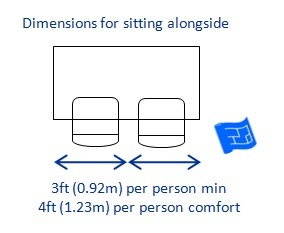 Let's take a look at the dimensions required for two people sitting opposite each other. Again the principle holds that the area in the middle of the desk is effectively shared.